Texas became the 28th state to join the Union on December 29, 1845. Texas' first two senators, Samuel Houston and Thomas Rusk, took office on February 21, 1846. Texas' longest-serving senators include Morris Sheppard (1913-1941) and Tom Connally (1929-1953). 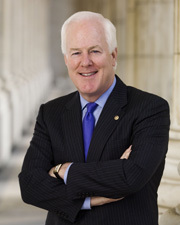 Among those who rose to leadership positions are Thomas Rusk, who served as the Senate's president pro tempore; Lyndon Johnson, who became Democratic floor leader; Kay Bailey Hutchison, who served as Republican Conference vice chair and Policy Committee chair; and John Cornyn, who served as Republican Conference vice chair, Campaign Committee chair, and assistant Republican leader. 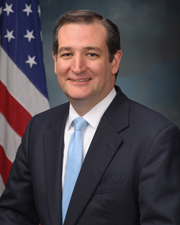 Three Texans served as vice president and therefore as the Senate's constitutional president or presiding officer—John Nance Garner, Lyndon Johnson, and George H. W. Bush.